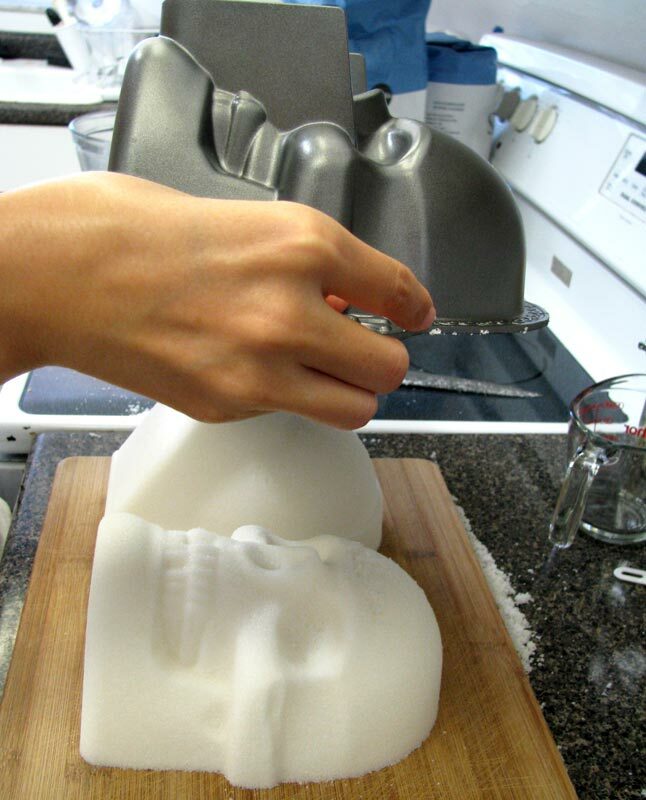 Making sugar skulls with a Nonstick 3D Skull Pan results in a super-cool life-size sugar skull! In the photo below you can see how much bigger the sugar skulls in the middle back row are compared to the other sugar skulls. Two life-size skulls surrounded by medium and large sugar skulls. Sugar skulls are made in Mexico in the weeks leading up to the Day of the Dead (called Día de Muertos in Mexico), and are given as colorful gifts or as offerings to the dearly departed during this special celebration in which we honor our loved ones who have passed away. In recent times, sugar skulls have come to be one of the most recognizable symbols of the Day of the Dead, with people all over the world making sugar skulls and adding their own personal creative twist to this meaningful tradition. Sugar skulls are traditionally made using melted sugar, but this tutorial uses a simple, safe recipe that anyone can use. 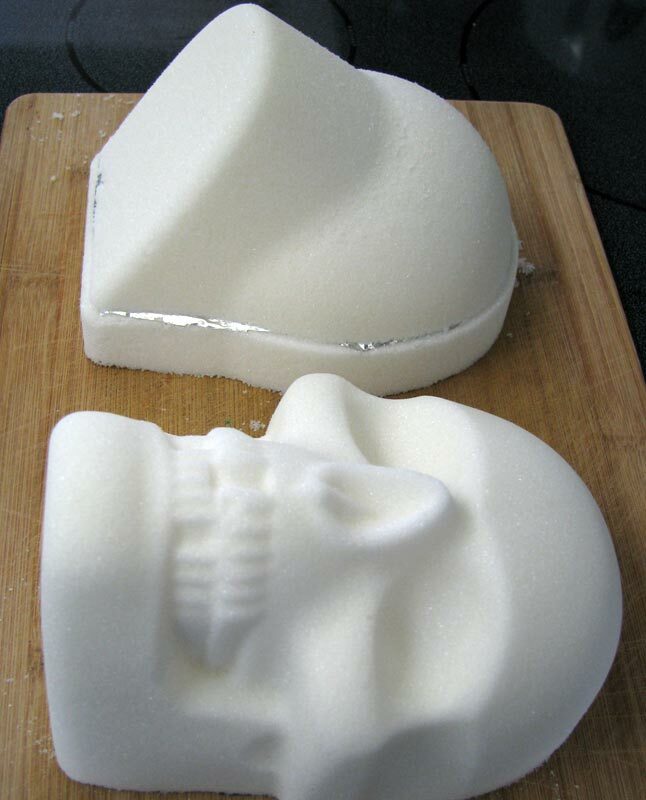 Sugar skulls are usually much smaller, but when I came across the Wilton Nonstick 3D Skull Pan I couldn't wait to try making life-size sugar skulls. 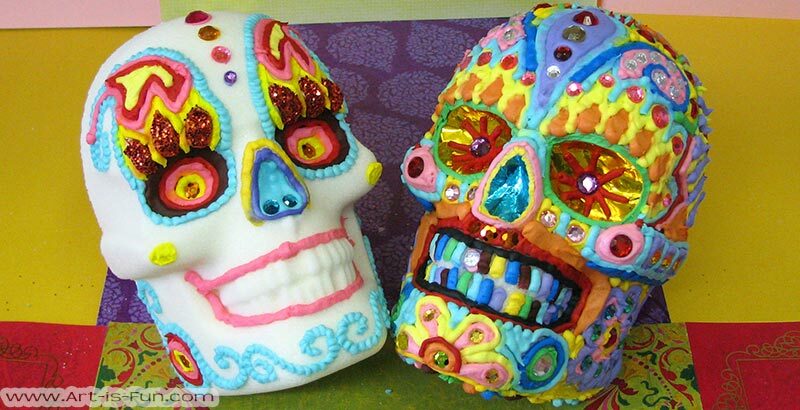 The Wilton mold was designed for Halloween-themed cakes, but with a little improvization, they produce magnificent sugar skulls, like the 2 you see above. Note: It appears that the Wilton Nonstick 3D Skull Pan that I used to create these sugar skulls might now be discontinued, but this Nordic Ware Haunted Skull Pan looks really similar and I think you could probably achieve something similar with it. Both this link and the one above will take you to the pans on Amazon, and if you make a purchase I may receive a small commission, which supports this site. 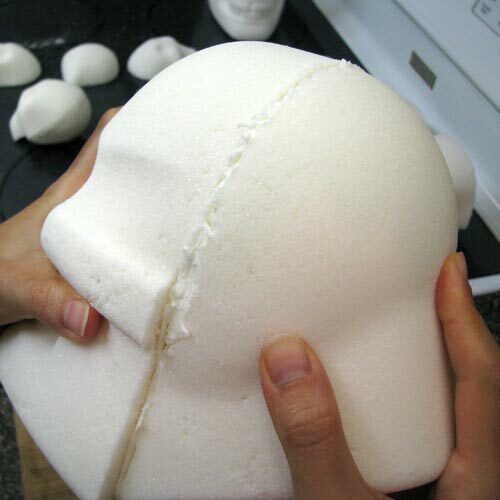 If you'd like to make the smaller skulls, seen in the top photo, check out our How to Make Sugar Skulls page. 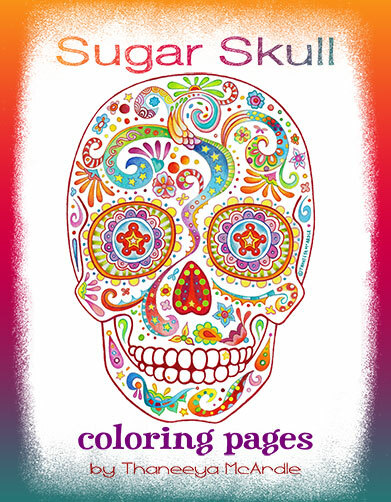 This page focuses on making sugar skulls only. For decorating tips, visit our How to Decorate Sugar Skulls page. Large sheet of cardboard or solid cutting board (anything flat that can hold the sugar skull when it comes out of the mold). 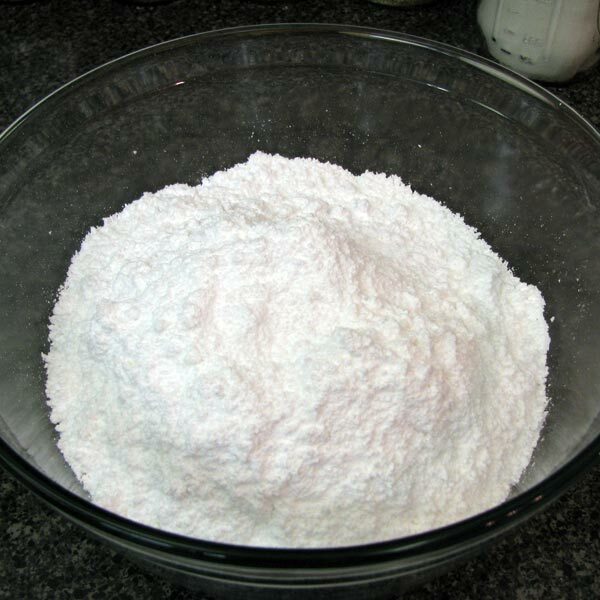 Meringue powder is made from dried egg whites and is very important (especially with a life-size sugar skull) in forming a hard, solid skull. Without it, your skull would be too fragile to handle. 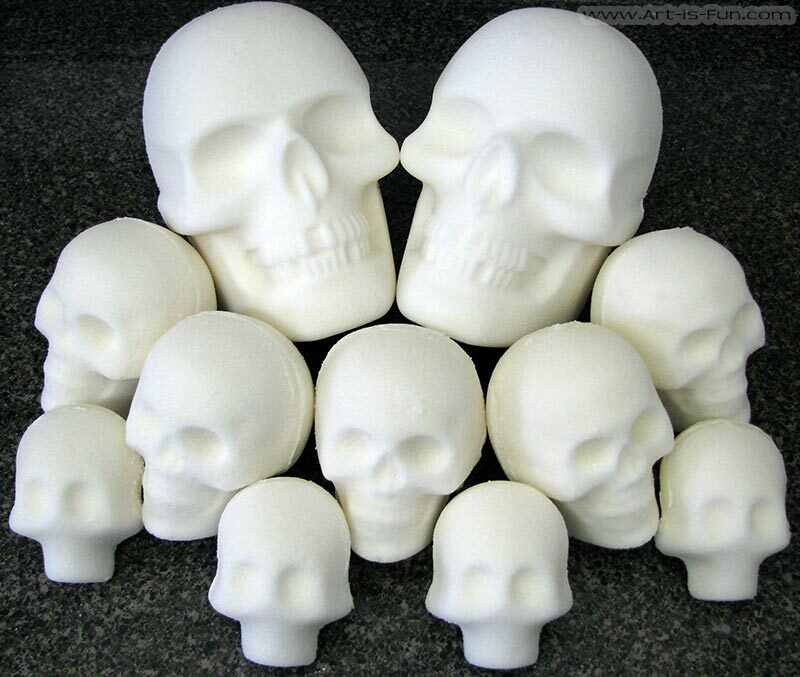 Most brands of meringue powder available in supermarkets aren't strong enough for sugar skulls. 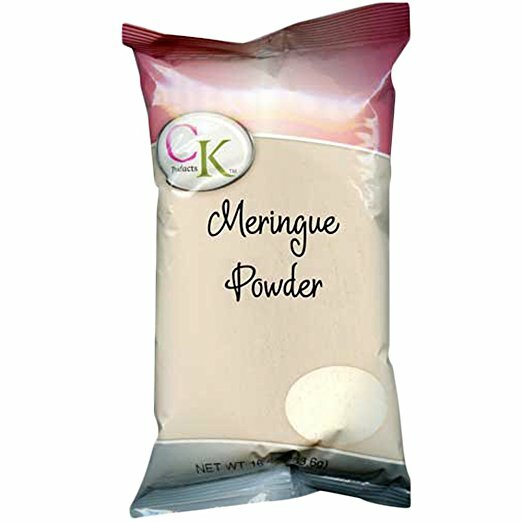 The best meringue powder for sugar skulls is made by CK Products, which you can find here on Amazon. 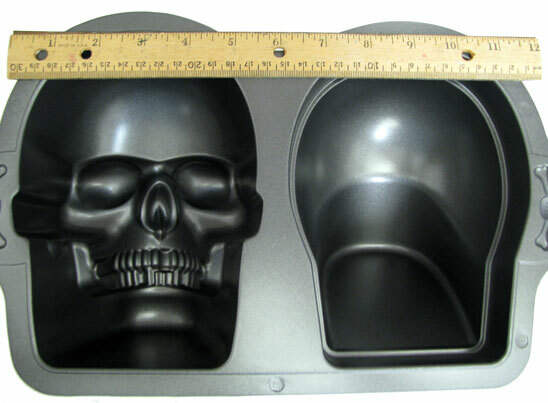 The Wilton Nonstick 3D Skull Pan is designed for cake-making, but it's well-suited to making life-size sugar skulls. As you can see, it's large and sturdy. 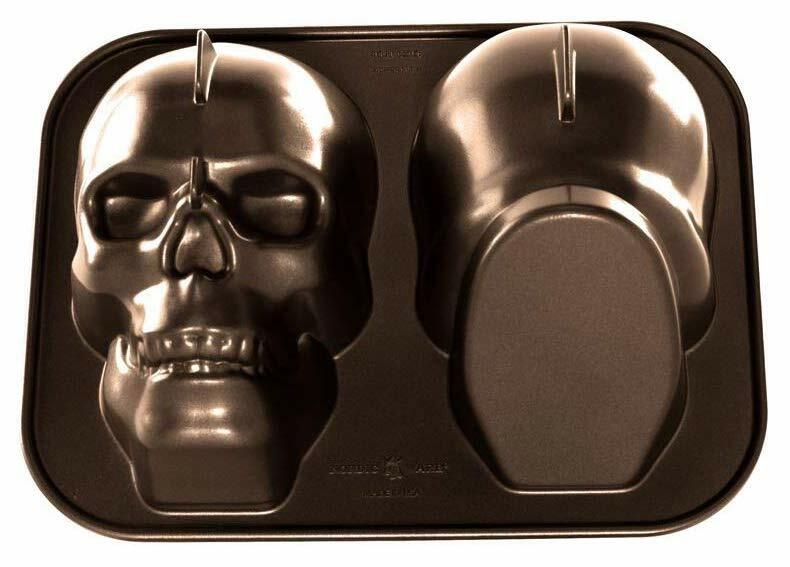 As I noted earlier, it appears that the Wilton Nonstick 3D Skull Pan shown above is discontinued so if you can't find one I would suggest the Nordic Ware Haunted Skull Pan shown below, which appears to have similar dimensions and features as the pan I used. If you make a purchase via the link above I receive a small commission, which helps support this site. When making sugar skulls, the measurements are very simple: for every 1 cup of sugar, add 1 tsp of meringue powder and 1 tsp of water. 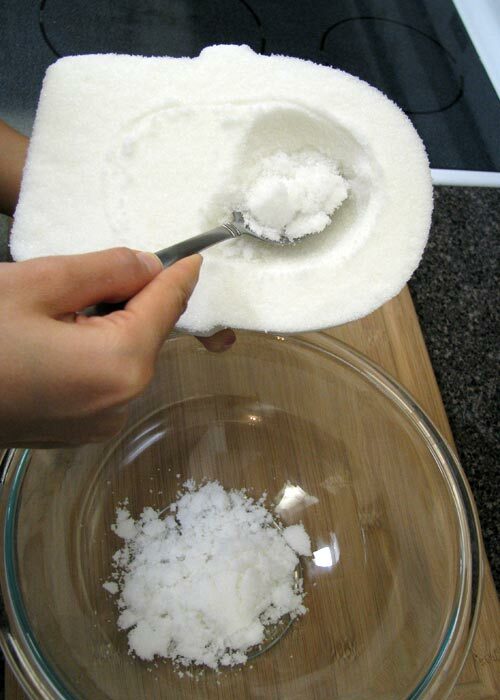 To make one life-size sugar skull you need 10 cups of sugar, 10 tsp of meringue powder, and 10 tsp of water. 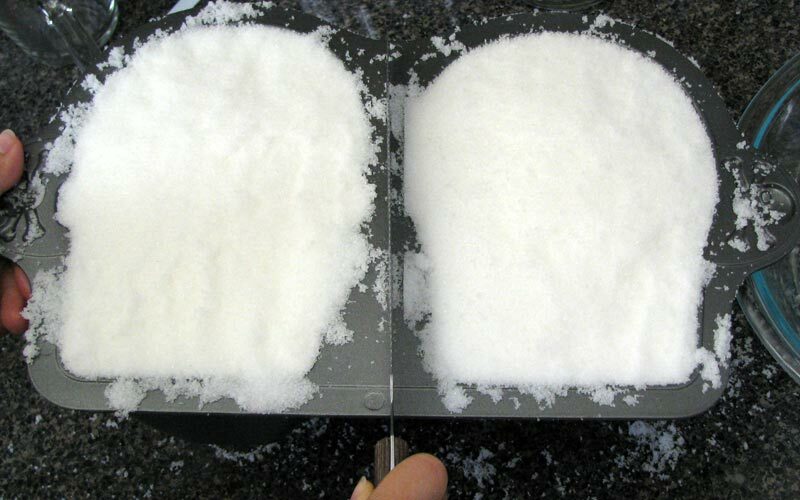 That's quite a lot of sugar, so if you don't have a huge mixing bowl, you may need to do several smaller batches. 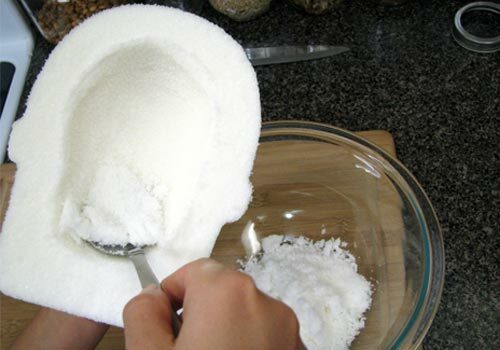 First, mix the sugar and meringue powder together and then add the water. 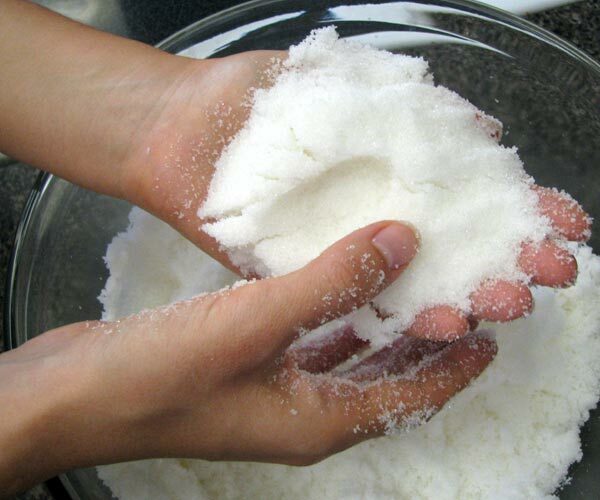 Mix with your hands until all the sugar is moistened by the water. It takes a while and it feels like there isn't enough water. But you don't want it too moist because it will stick to the mold. 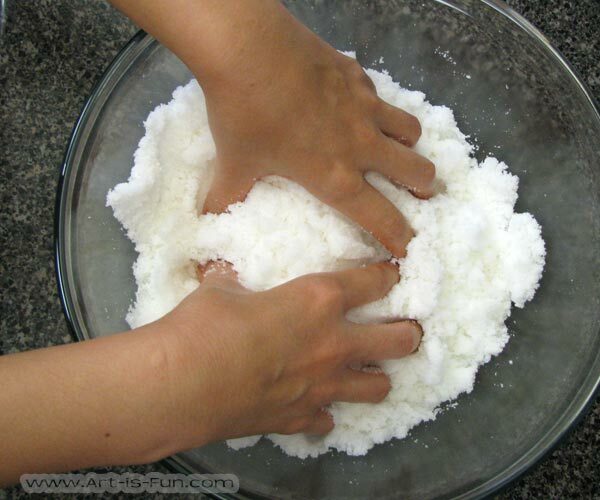 It should feel like beach sand and be able to hold its shape when you squeeze a clump and make an indentation with your thumb. If it won't hold together it's too dry. The front and back parts of the mold are filled in differently. The Wilton Nonstick 3D Skull pan was designed for cake-making, which presents a problem. 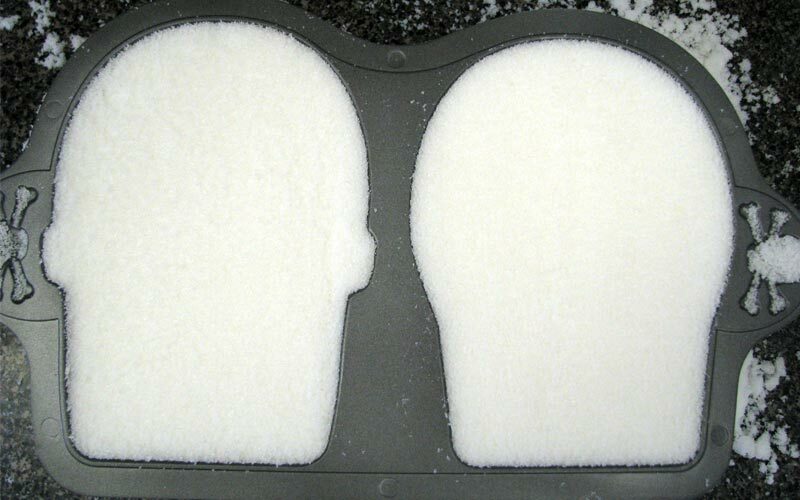 The back part of the mold was designed with a spacer on the back, which is supposed to be cut off after baking, before the two sides are glued together (see image on right). It's easy to cut off this section when it's a cake, but not when it's a drying sugar skull, which can be hard on the outside, and soft in the center. Instead of cutting off the extra section, we're going to use aluminum foil to separate the main part from the section that is supposed to be cut off. The front part of the mold (on the left side) can be filled in normally. 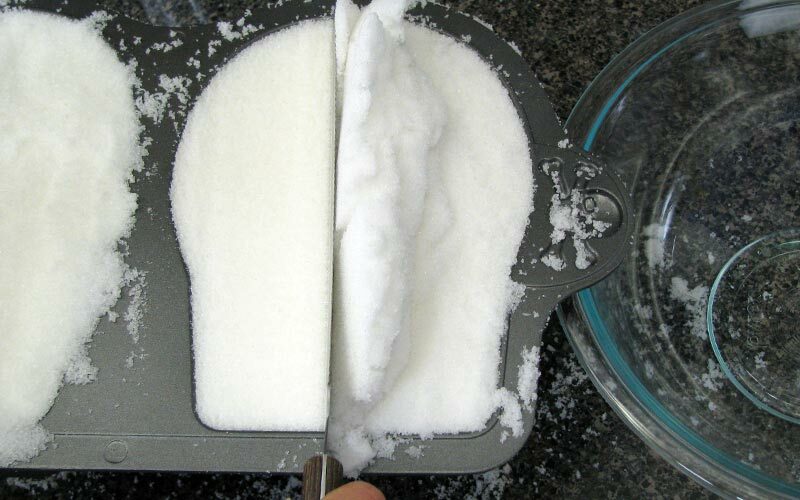 Press the sugar into the mold as hard as you can and fill it to the top. 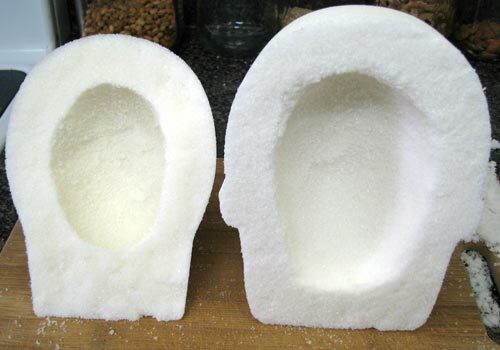 The back part of the mold (on the right side) should only be filled in to the ridge. Fill the front (left) mold to the top. Fill the back (right) mold to the ridge. 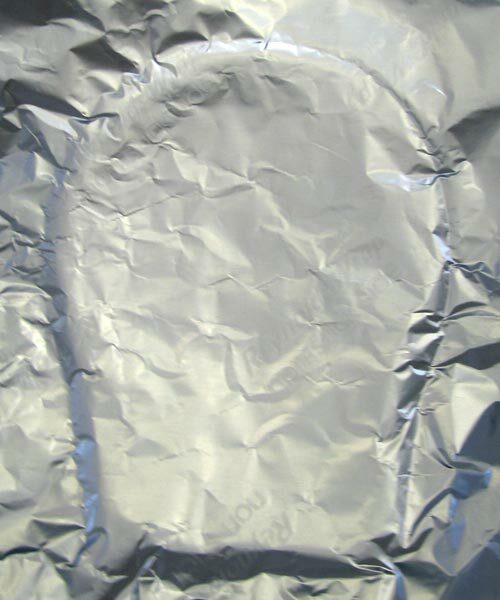 Take some aluminum foil and lay it over top of the back part. 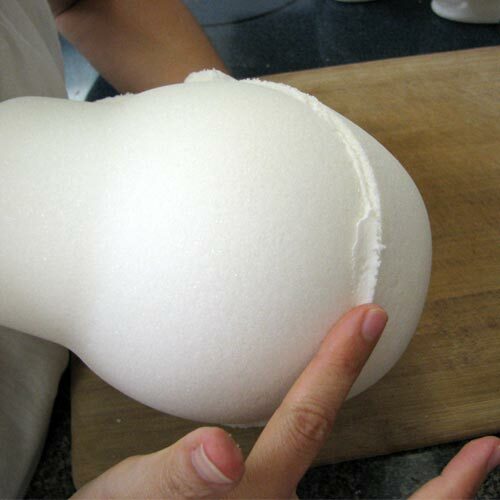 Bend it to conform with the shape of the mold, so you know where to cut. Trim the foil with scissors so that it will fit in the mold. Now it's time to fill up the rest of the mold, so that it won't collapse when you flip it over. Because this back part will just be removed after drying time, you don't need to worry about longevity. So just mix up 4 cups of sugar and 4 tsp of water (no meringue powder). 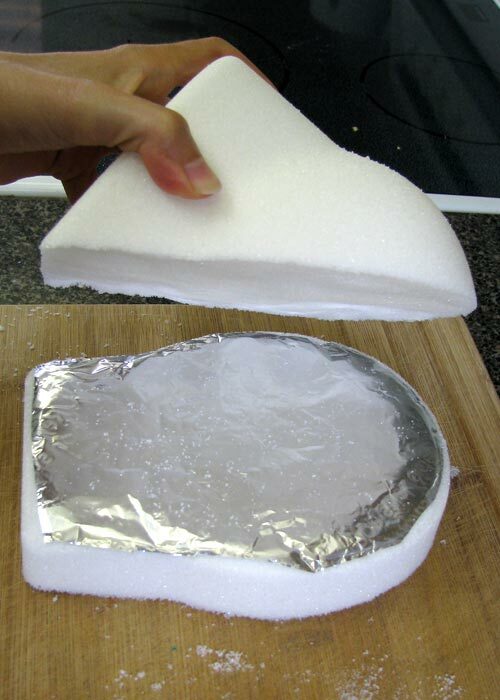 Pack that tightly in the mold on top of the aluminum foil. Note: the mold is quite heavy when full, so if you think you might struggle to lift it up and flip it over, you should fill and flip one side at a time (or find a strong person to do it for you). 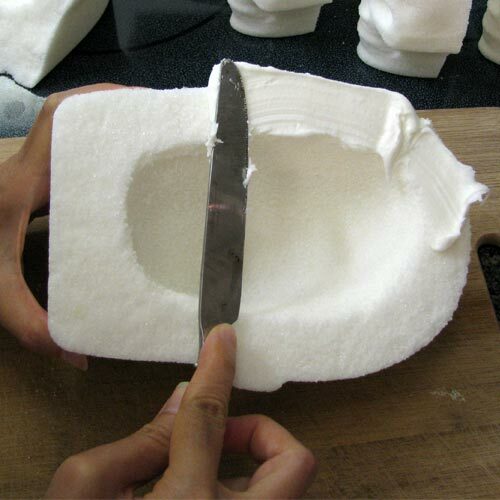 Now that both sides of the mold are full, you need to scrape off any excess sugar so that the surface is flat and even. Step 4: Flip over and remove the mold. 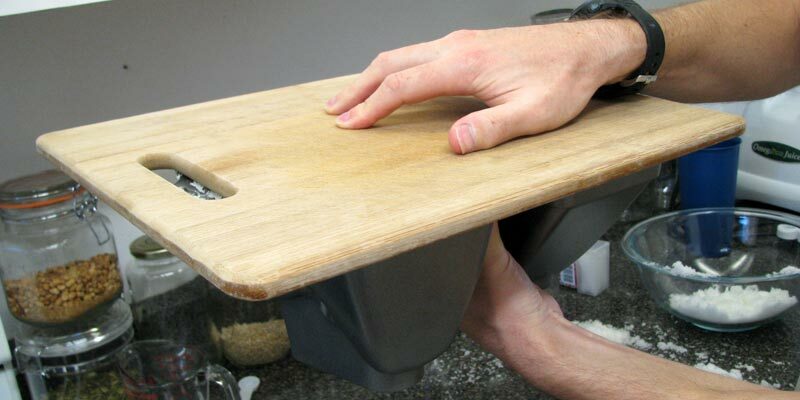 Place the chopping board (or whatever flat surface you're using) and, while holding it tightly in place, flip the mold over and carefully place it down. 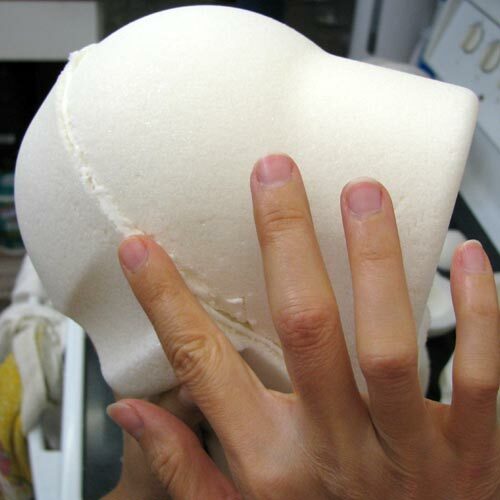 Now slowly lift off the mold to reveal your life-size sugar skull. Let your skull dry for 5 to 6 hours, by which time the outside will be hard enough to handle, but the center will be soft enough to scoop out. Scooping out the center of both the front and back parts of the skull is important because it makes the skull lighter, helps it dry properly, and makes the two sides easier to glue together. Important: Don't make sugar skulls when it's raining or humid because they won't dry properly. If you live in a humid climate like me, make your skulls in an air-conditioned environment. 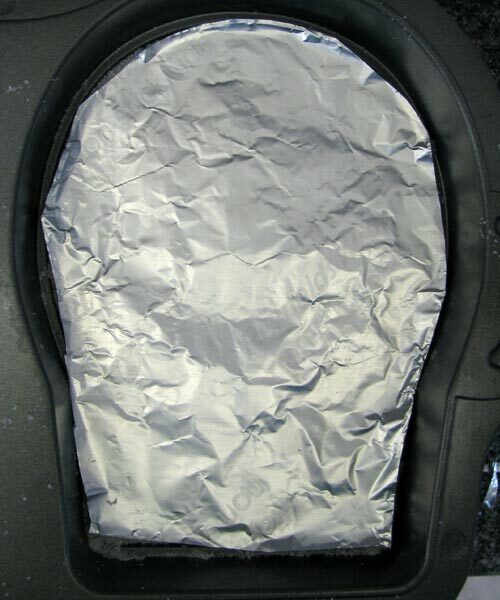 First, remove the back part of the skull from the section you isolated with the aluminum foil. Treat the parts with great care because they are still very fragile. Scoop out the middle, staying away from the neck, and leaving a 1 inch gap to the edge. After you're done, give your skull another 6 hours to dry before moving onto steps 6 & 7. Royal icing dries really hard (no need for refrigeration) and acts as a strong adhesive. In addition to using it later as a decoration, you're going to use it to glue the front and back parts of the skull together. The recipe consists of 1 pound of powdered sugar, 1/4 cup of meringue powder, and 1/3 cup of water. This will give you enough to glue at least 6 life-size skulls. Adjust the measurements if you're making fewer skulls. 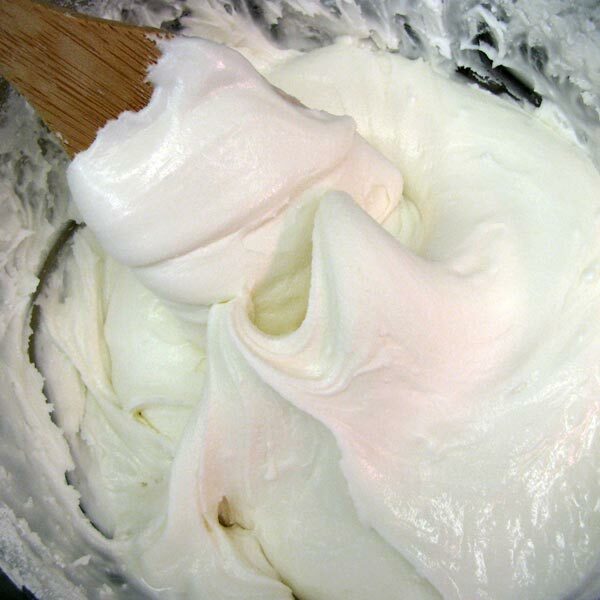 Mix the ingredients together in a large bowl using an electric mixer or a wooden spoon or spatula (which takes more effort) for 5 to 10 minutes until the icing peaks. 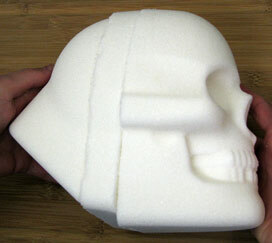 If your icing isn't thick enough the back part of the skull will keep sliding off the front part. Now that your skull has dried for another 6 hours it's time to glue the front and back parts together. Use a knife (or pastry bag) to apply the royal icing to the front skull only. 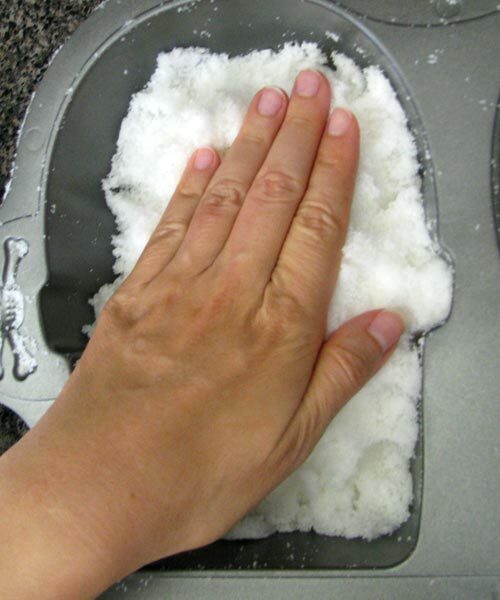 Apply a good amount because any extra will be squeezed out the side and simply wiped off. Now press the parts together to form a complete skull and run your finger along the edge to spread or remove any surplus icing. Don't worry if some icing gets stuck on the outside of the skull because it will be covered by the decorations. You'll notice that the back part doesn't match the front to form a perfect skull. The back part helps create the illusion of a complete skull, but mostly acts as a stand that props up the front part of the skull for optimal display. Now you're done making sugar skulls! Let's see how they look. 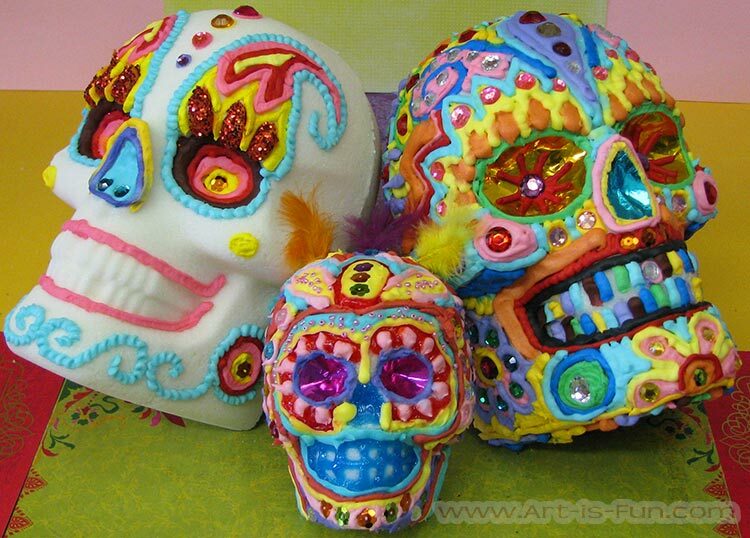 ...Check out our How to Decorate Sugar Skulls page! 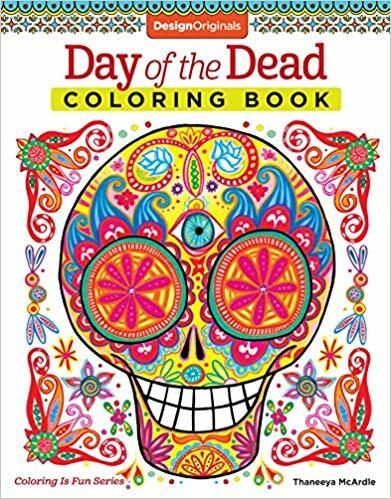 If you like to color, I have a variety of Day of the Dead-themed options for you! My Sugar Skulls Coloring Book (below left) focuses entirely on sugar skulls, whereas my Day of the Dead Coloring Book (below middle), in addition to sugar skulls, features images inspired by other Day of the Dead imagery like papel picado, dancing skeletons, skulls in nichos and a waving Catrina. 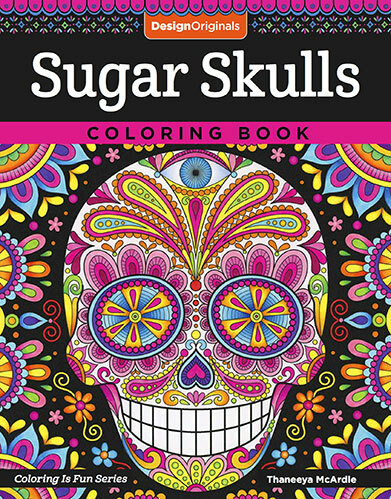 If you prefer printable coloring pages I also offer a downloadable PDF coloring book of detailed Sugar Skull Coloring Pages (below right)!